Responding to Human Trafficking is the first book to critically examine responses to the growing issue of human trafficking in Canada. 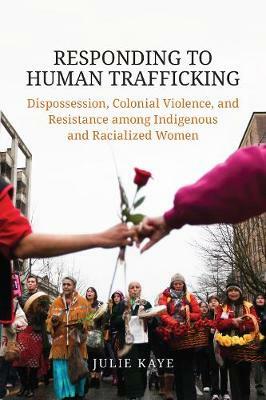 Julie Kaye challenges the separation of trafficking debates into international versus domestic emphases and explores the tangled ways in which anti-trafficking policies reflect and reinforce the settler-colonial nation-building project of Canada. In doing so, Kaye reveals how some anti-trafficking measures create additional harms for the individuals they are trying to protect, particularly migrant and Indigenous women. The author's critical examination draws upon theories of post- and settler-colonialism, Indigenous feminist thought, and fifty-six interviews with people in counter-trafficking employment across Western Canada. Responding to Human Trafficking provides a new framework for critical analyses of anti-trafficking and other rights-based and anti-violence interventions. Kaye disrupts measures that contribute to the insecurity experienced by trafficked women and individuals affected by anti-trafficking responses by pointing to anti-colonial organizing and the possibilities of reciprocity in relationships of care.